A full day tour with a maximum group size of 11 people lets you enjoy a scenic, historical and cultural journey around the island of Oahu. 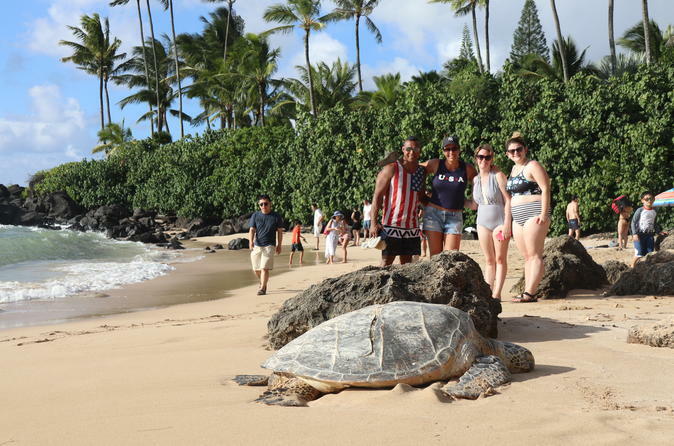 Highlights of the this tour include Dole plantation, Turtle Beach, Waimea bay / Waimea falls, snorkeling with tropical fish using equipment we provide. Free macadamia coffee and fresh macadamia nuts from the tree and so much more. Our guide will document the day through photo's which will be made available after your tour. Come join us and let us show you an unforgettable day. The tour begins with a pick up at your hotel around 8:30am. Our first stop is at the Dole plantation to learn all about the history of Dole on Hawaii. Train and garden tours are available for purchase during this 40 minute stop, or just browse the shop and don't forget to try some delicious pineapple ice cream. Continue driving through historic Haleiwa town and watch Sea green turtles swimming along the beach. Next our group has the option to split into 2 groups at Waimea Valley. Our group has the free option of enjoying Waimea bay; the most famous north shore beach which gives you an opportunity to go for a swim or even go cliff jumping. The other members of our group may choose to pay admission to Waimea Valley and hike through botanical gardens and a reconstructed ancient Hawaiian village to the beautiful Waimea falls. The hike takes about 25 minutes along an easy paved walkway. (Shuttle service is available for an additional fee) Life jackets are provided for swimming under the waterfall. Enjoy a long lunch break with a variety local food trucks. Wonder over to Shark's Cove after your meal and enjoy the beautiful scenery on the beach or snorkel with tropical fish. (This stop may be substituted with an alternate location depending on the day) We provide snorkel gear for everyone. Our journey continues past the famous Hollywood movie sites at Kualoa Ranch before making quick stop for photos at Chinaman's hat. Enjoy a quick energy boost as we stop for free samples of flavored macadamia nuts and coffee, or crack fresh macadamia nuts from the tree. Our last stop is a scenic lookout overlooking Oahu's east side and the majestic landscape of the battle that unified Hawaii. The tour finishes with a drop off at your hotel around 5:30pm.